They hid in the U-bend of the tunnel for hours, listening, waiting to see if the bane would find the other end of the tunnel. I never did. They came out in the afternoon light and set to work patching up Simon as best they could, using a little Wyld weed the raccoon cub had stashed away in her clothing. The maned wolf did little but lie on the grass, too exhausted to walk. Thane and Rusty were debating whether or not to camp there for the night and let Simon rest, or try to put more distance between them and Houndsmouth when the bushes near them rustled and shook. The company froze. Thane reached for his sword, but it was gone. That’s when Brun stepped out of the woods. The bear looked over them all, but didn’t greet them until he saw the three cubs, all safe. The older cubs ran up and hugged his leg. Ramsey pouted, promised sweetie still unaccounted for. Brun rested his healed paws on the cubs’ heads. “They’re braver than I am!” Zeke whispered to Rusty. The bear reached into the pouch around his neck and pulled out a teal-green leaf. The cubs let go and Brun bent over the Simon. “Chew this.” He stuck the leaf in the maned wolf’s mouth. Simon obeyed. Green froth gathered at the corners of his lips. Even chewing was exhausting. And indeed, a half-hour later, Simon was on his feet again, leaning on Rusty as they followed Brun and Thane. The air around them was clear, the chatter of the cubs carrying through the healthy greenery of Cedar Vale as they walked. In this light the dark marks of Rot could clearly be seen on the maned wolf. They striped Simon’s russet fur like black welts. “The druids are seen more often now. A portent,” said the bear. Yes, of something evil, thought Thane. A bird cheeped sweetly, out of sight. “It is my clan’s way,” said the bear. They ducked under some hanging vines. They waited on the other side while Rusty, Simon, Zeke, and the cubs came through the curtain. When they were through, the bear and wolf continued on ahead of them. The bear nodded, but said nothing more. Behind them, the hoglets giggled. Darby was tickling his brother with a fluffy dandelion stem, the pain in his eyes gone for a moment. Naomi the raccoon shyly pulled on Rusty’s torn sleeve. “Then learn to dance, and you can be my backup dancer.” The vixen bumped hips with the cub, and they laughed. The vixen stopped to unlatch her lute’s teardrop-shaped case. The hoglets stopped playing to watch. Rusty swiped off the bane muck and travel mud and pulled out her lute, clean and golden and shining. She plucked each string, tuned the third course sharper. The raccoon girl took her case upon her back. Rusty nodded in approval. She plucked the jaunty pickup notes. Zeke grinned. Simon lifted his gaze from his Rot marks and sighed, smiling. This one was still a favorite back home. but don’t let your tail hang low! 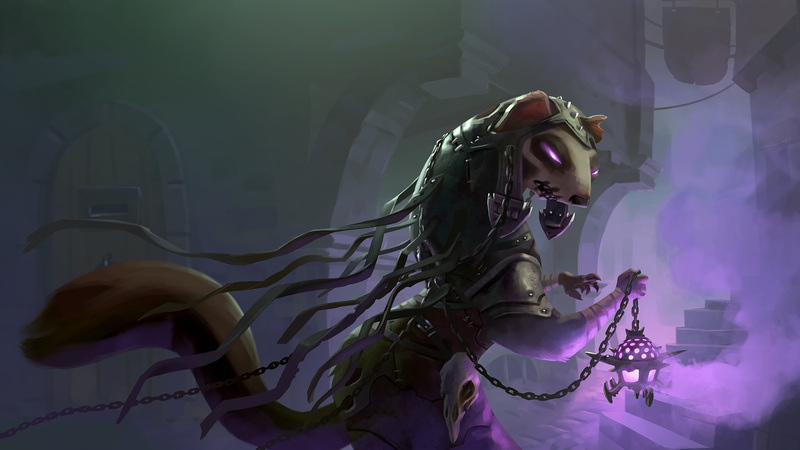 my heart will lead back to Armello! She was still singing when they danced into camp. …to Kristin G., for proofreading yet another Armello story even though she’s never played the game. …to Steam user CCCMiller for sharing their headcanon linking the characters on the Dark Influence and Warlock cards. …to Steam user StealthPacifist for grabbing some settlement names for me at the last minute! …and to the League of Geeks for coming up with an amazing game with memorable location names! Buy Armello today! Danielle Williams has always loved talking animal stories. Some of her favorites include Watership Down, the Ratha series, and the tales of Rick Raccoon and Scarlett Fox in Ranger Rick magazine. She currently writes original sci-fi, fantasy, and horror fiction at Pixelvania Publishing, her author site. Subscribe to her newsletter to be emailed when she releases new eBooks and stories! Thank you for reading! Please leave a comment if you enjoyed it! Download the complete story PDF on this page. The next part happened so fast, Thane hardly believed he’d seen it with his own eyes. Simon charged for a thick clump of bushes not far from the tunnel entrance. Before he reached it though, Zeke’s bleary face popped out from the bush. The bane saw the possum and shrieked. Prey spotted. It jutted his head for the possum, like a hawk going to #@$%*! a gob of meat. The possum froze on the spot, but while he trembled, Stilts grabbed him up, curling his body over the possum. The bird’s beak knocked into the shield the maned wolf had been carrying on his back, and sent them both careening into a stand of trees—one further away from the tunnel. The bird pecked at the shield. The cloth covering it turned mothworn. The bane’s beak snipped at it and pecked again. Its beak hit the shield and rust exploded over the surface like frost over a windowpane. It pecked a third time. The shield cracked. The bane clacked its beak around Simon, snipping clothes and fur when it wasn’t breaking the shield apart. Long arms shoved something white and grey. Zeke tumbled and tumbled over the ground, away from the attack, towards the tunnel. He didn’t wait for his momentum to run out, but came out of the roll on all fours and fled right into the tunnel. He knocked into Thane before he squeezed into the darkness. It woke the wolf up; his squire was still out there getting savaged! But the bane could easily kill them both. I’m prince of the wolf clan. If I die, I cannot lead. Fur flew. A flash of crimson glinted in the air. But if I abandon my packmate, I’m not fit to lead. Stilts—Simon—had refused to abandon Zeke. Thane couldn’t do less. Toying with its prey had excited the bane. It flapped its wings without lift, exposing the side of its breast. Thane exploded out of the tunnel. His claws tore up yellowed grass. He ran as fast as he knew how, the fastest he’d ever run before. In the blink of an eye, he was next to the bane’s breast. He stabbed his sword in, intending to plunge it into the creature’s heart. But though it pierced the razor-sharp feathers, it hit something inside, a rib perhaps, and glanced off at a strange angle, jarring his arm. The sword slid out of his paws, flew into the air, and landed feet away in a bush. Not a killing blow. The bane squawked, though, and jumped back. Thane didn’t wait to see what the bane would do next. Instead, he ran to Simon and swept him up. The maned wolf was cut open everywhere, but his eyes were bright with fear, alive with it. So when he saw Thane and felt the prince’s arms supporting him, he stumbled to and ran with Thane into the tunnel, shedding rust and torn clothes up until the moment they crammed inside again. Simon yelped in pain, but Thane kept shoving him ahead, deeper into the tunnel. CRACK. The bane shoved its beak into the hole, brushing Thane’s tail. It shot under his belly, curling tight. “Keep moving, Simon!” The bird was twisting its beak, wrenching the whole bigger. Thane glanced back at it. Rocks and soil fell around the beak. Its head would be in with them shortly. “You’ve got to keep going! It’s getting in!” Thane shoved Simon again and again. Pain made the maned wolf yelp every time, but he scrabbled and scrabbled until his legs and arms were underneath him. Muscles burning, he pushed himself forward. Thane was right up on him. Simon couldn’t see ahead. Only darkness. Sudden exhaustion dropped upon the maned wolf. His tongue lolled upon the bitter dirt. He’d never get out. It was too far to go. He just wanted to lie down. At least the cubs are safe. His head grew heavy, began to sink. Then, something glittered ahead of him in the dark. Simon stared at it, befuddled, then excited. Daylight! The exit out must be nearby! The burst of hope made him lunge forward. But when he got closer, he realized it wasn’t the exit at all, but a shining object. He grabbed the twinkling thing up in his paw just as Zeke’s white face pop into view. The broken chain of the necklace flopped over his paw. Thane trembled. He could feel the maned wolf’s body surrendering in the tunnel ahead of him. Behind him, the bane caught a glimpse of grey fur and began chewing the tunnel entrance frantically. Thane pressed into Simon’s warm, furry body, but the exhausted wolf didn’t go any further. Thane was caught between the two. There was no escape. So this is it. My end. Funny, I thought I’d be more of a participant—at least take my enemy with me! But it looks like I’ll die like a cork in a bottle. Thane thought of his home in the north, his pack. Feathers scraped the tunnel walls. River will lead. Stupid River! But she’ll do a good job. Better than I ever did. Thane turned. Even if he had to die like a snail in its shell, he intended to look his death in the eye, like a wolf. Violet eyes gleamed at him, vicious, victorious. The bane’s beak gaped. Thane fell into the open space, flipped over, then thrust himself forward just in time. The bane’s sharp beak snapped down on air. “Keep going!” shouted Thane, over the roar of the bird. He wasn’t sure anyone could hear him, but it seemed the right thing to do. The grey wolf threw himself forward again, once, twice—then the tunnel dipped, into the U-bend. Thane glanced behind him. The violet eye seemed to burn with hate. Thane slithered into the heart of the tunnel, disappearing from sight. The bane screamed in frustration. Thane didn’t remember smelling any of this, but he kept running. Surely the tunnel was close by. He nodded, swerving to gather them under the crown of a large tree. Fox, raccoon, and hoglet bent over, bracing themselves on their knees, sucking in air. Thane sheathed his sword and leapt up into the tree. He climbed to the top, stuck his head above the branches. “Zeke!” cried Simon, skidding to a halt. “He’s fainted!” He dodged back, grabbed the possum’s limp form, then caught up to Thane again. “Poor chap, must have thought we were out to eat him.” Thane sniffed the air. “They’re just ahead—and hey presto, they’re almost at the tunnel. Fellows, it’s us!” he called. Zeke wheezed and panted, tearing through the underbrush. His new shiny bounced up and down on his neck. Hard to believe a bear could move so fast, even with a groggy hoglet riding his broad shoulders. Zeke had stumbled a couple times and his hoglet, the older one, had had to help him stay upright. The hoglet was racing ahead of him now, spines bouncing. But at least being behind meant he knew where Rusty and the raccoon kit were. The pair of red and striped tails were easier to keep track of in the dense forest where branches tore at sleeves and roots tripped tender paws. He had no idea where they’d wind up, just that the bear had crashed out of the forest during their flight, had bellowed, “Follow me!” and everyone had obeyed. Lucky for them the bear had waited up while Zeke got the hoglet free of the raspberry briars. And that Rusty’s scream-singing—which he’d only heard before in pubs—could stop a bane dead in its tracks. Too bad the bear can’t cast or fight for us anymore. Zeke had glimpsed the bear’s blistered paws, noted the war club idle on his back, and figured that must be why even the mighty warmage had turned tail with them. A branch grabbed Zeke’s sleeve. He punched his shoulder forward, tearing his shirt but not breaking pace. And I don’t have any more shirts in this color! Assuming he survived, Zeke was going to make four new—no, scratch that. He was going to hire a tailor to make him four new shirts, in this color. He’d always wanted to have a bespoke shirt, but something had always gotten in the way before. Stupid stuff. His tongue lolled. You gotta do what you want while you’re still alive to enjoy it! He stepped on a slimy mushroom and slipped. He floundered, arms circling in the air, but didn’t fall. Glancing back behind him, he noticed a nearby stand of mushrooms, well picked-over. Didn’t I harvest those earlier? Where was the bear taking them? Behind him, the bane screamed. That was enough to send ice up the possum’s heart, but then he heard a rustling coming up beside him. It was coming up FAST. The panic almost made him sick. What could that be? That crazy baroness? What kind of nasty tricks would she have in store for them? The rustling crashed in his ears. It was upon him. This was it. He’d been caught! HE WAS GOING TO DIE! His vision narrowed. Black edged in, and then the possum dropped to the ground. The newest chapter arrives at tomorrow at noon. 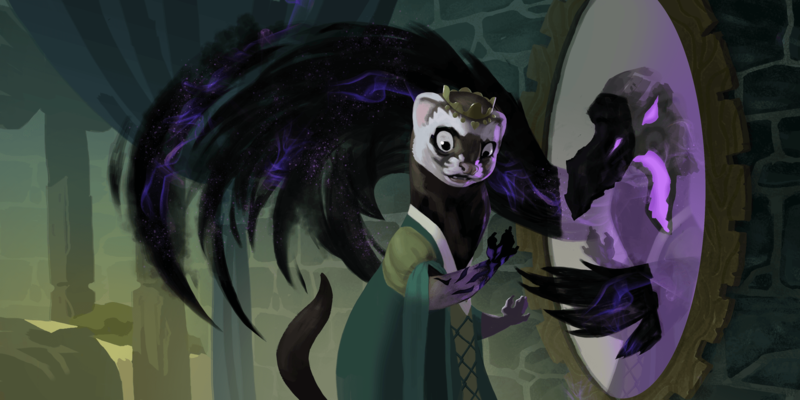 The game Armello and its characters are property League of Geeks. Buy it today! For previous chapters, click the tag “Heroes of Houndsmouth“; older chapters are towards the bottom. You might also like to watch this four minute video because it shows off more special possum talents. They followed the trail of dying plants, dodging tree limbs that creaked and fell onto the carpet of blackened leaves preceeding them. Equipment jounced against Simon’s narrow haunches, but he never flagged. Simon checked over his shoulder. Rusty had already fled. Nubine had stopped trying to scrabble up the smooth spire and had turned to them, back against the wall. Thane and Simon surrounded her. The smell of smoke on the air was getting stronger. Their shadows lay hazily over the ferret, outlined in orange. “Don’t get too close. She could bite,” said Thane in an undertone. He picked up the torn band of Rusty’s skirt, which had fallen on the grass during the ferret’s struggle to climb. A strange sight met Thane, Brun, and Simon as they came up the hill. Baroness Nubine was at the top of the hill, weaving and jumping about in a weaselly war dance. She paused a second to gulp down more of the cursed wine. She hadn’t seen the wolves and bear behind her yet. They ducked low to hide in the grass, watching. Rusty, Zeke, and the cubs were over the hill, backs to a sheer spire of stones they hadn’t seen on the way in. They were throwing rocks at the baroness, except for Naomi, who whipped them out of Zeke’s bird-hunting sling. She’s not a bad shot, either, thought Thane. She knows how to lead her target! One shot looked like it would land for certain, blurring straight for the ferret, right between her eyes. But a foot or so before it landed, green shimmering light flashed in the inferno-lit night, and the rock ricocheted off it. It wasn’t the most unfair fight Thane had ever been in, but it was in the top five. The worst three, of course, were always instigated by his sister River. But she was a dirty cheat who always surprised you with an arrow across your nose. At least they’d been clan-regulated bouts, so she hadn’t wound up killing him. Or vice-versa.